Over the past seven years, Procter & Gamble has tripled profits; significantly improved organic revenue growth, cash flow, and operating margins; and averaged earnings per share growth of 12 percent. How? 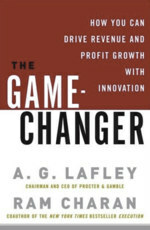 A.G. Lafley and his leadership team have integrated innovation into everything P&G does and created new customers and new markets. We live in a world of unprecedented change, increasing global competitiveness, and the very real threat of commoditization. Innovation in this world is the best way to win -- arguably the only way to really win. Innovation is not a separate, discrete activity but the job of everyone in a leadership position and the integral, central driving force for any business that wants to grow organically and succeed on a sustained basis. This is a game-changing book that helps you redefine your leadership and improve your management game.